I`m looking for some detail informations about sassanid swords - persian swords from 6-7th. especially about unique pistol grip construction. Maybe some of you have the HQ pictures of this sword from BMuseum ? Maybe some of you know more about construction of that kind of grip? ... or maybe some of you have already recreated sassanid sword? Please, need some help with this interesting weapon. Persian (Sasanian) sword and scabbard, 7th c, gold over wood, inlaid with garnets and glass, a pattern of overlapping feathers on the surface, long narrow grip with two finger rests, scabbard with projections for strap attachment for suspending from the warrior's belt in such a way that it could easily be drawn even on horseback, Sasanian kings are almost always depicted with a sword suspended from the belt, a motif appropriate to the victor in combat. L. 39 1/2 in. (100.3 cm). Met Museum. I took a few high res photos of these swords on my last visit. I will get them uploaded tonight when I am back home. thank you Eric - I know these examples, but the sword from BM is a little different style of grip and I want to recreate exactly like this one. William - I think that your photos can help me - I will waiting for them. 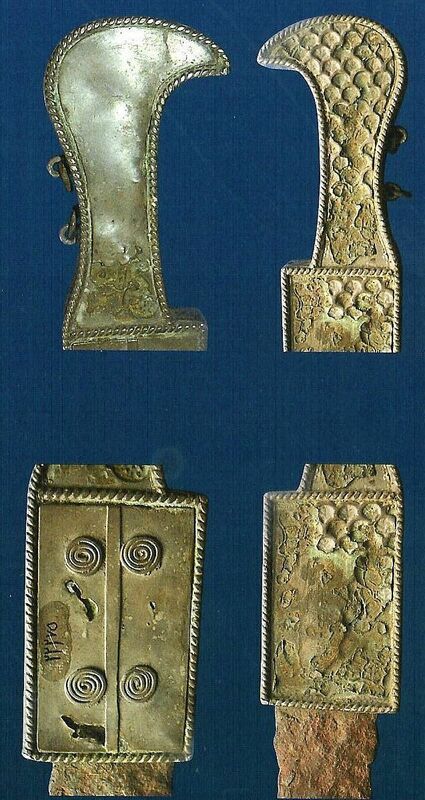 Hopefully you can find some clearer images, Museums should really learn to take better pictures of the items that have in their collections. What do the blades of these swords look like? All of the pictures I find of these weapons always have the scabbards on. As promised here is a shot of the silver one. I don't think I have a shot of the gold one as it was displayed a little too high for a decent shot. Also check out this website where the blade is out of the scabbard, although it is in pretty poor condition. thanks very much William. nice photo. this is the one I want to recreate. I`ll wait - maybe someone have more pictures. 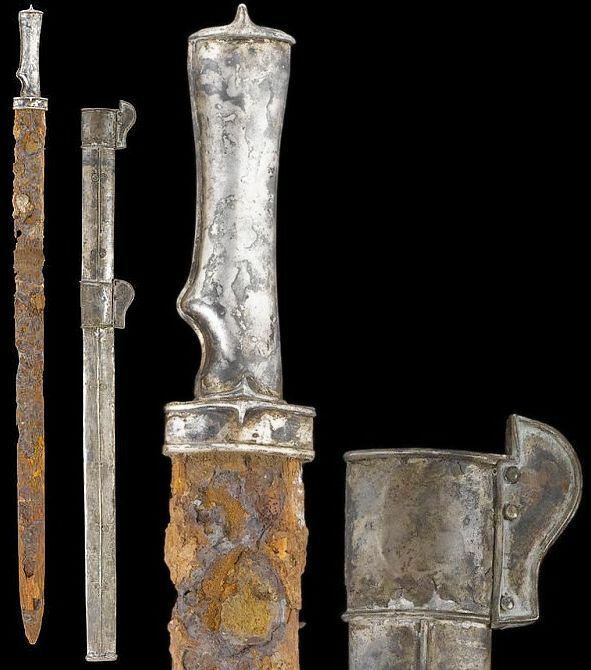 Components of Sassanian swords from the late Sassanian era. 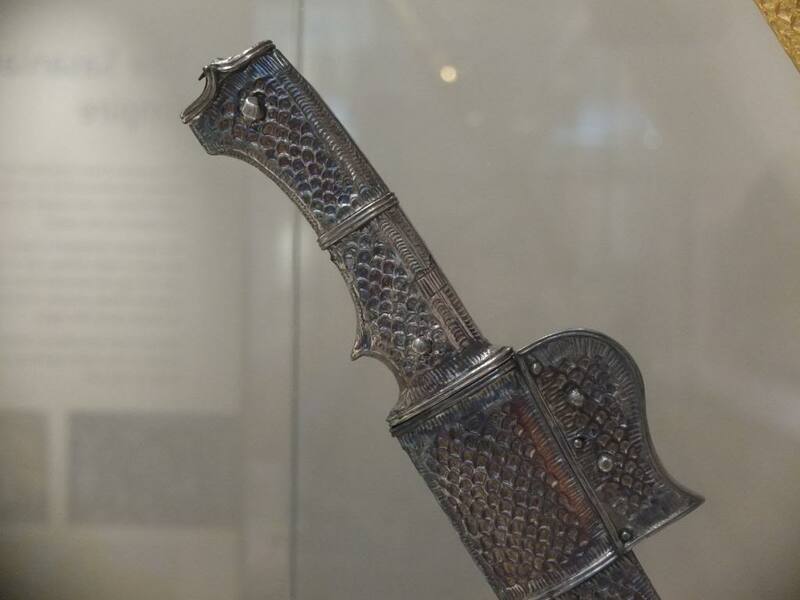 Weapons of this type would have been typical during the early 7th century wars between the Byzantine and Sassanian empires. The weapons shown above have never been seen by Western historians nor displayed in Western museums. These appeared as a result of Manouchehr Moshtagh Khorasani’s 10-year study of Iranian weapons. thank you Eric, I know some of these pictures. Have you checked out these pages via the Online Collection section of the British Museum website? They contain more photos, dimensions and information about 4 swords. Any idea how many edges these swords have? The pistol grip makes me think maybe one? Hey great, this thread is back! 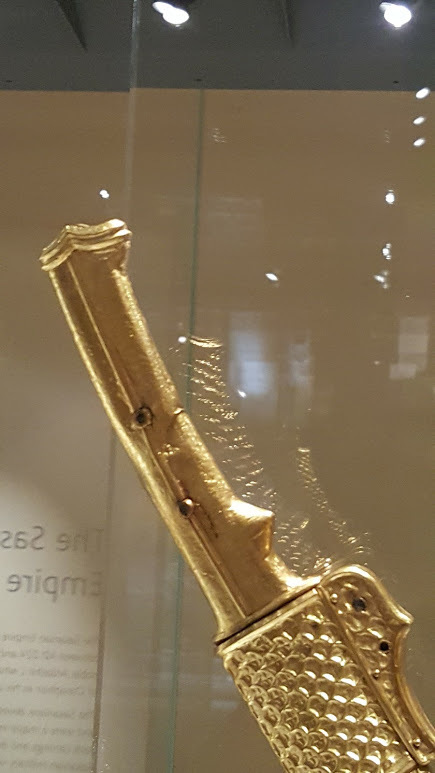 Here is a photo of the golden sword from the British Museum. Edge wise I have no idea as the only swords of this type have always been inside their scabbard. It is rather hard to tell! The scabbard and grip look related to early sabres, I'd have to wonder if any of these straight swords had one edge, and then they developed a slight curve, or if single edge and curve developed together. I know Charlemagne's sword has some edge on the back, so maybe it is the latter. I'm wondering if the items here are actual, functional swords, or some "decorative" / symbolic items ? The reason I wonder about their functionality are the studs/rings on what would normally be the back ot the grip, where the users palm would be be..items such as these would make for a most uncomfortable grip, I would think ? ?